This information is for parents/guardians of current 5th graders who will attend South Middle School. This school year is flying by and before you know it, your 5th grader will be in middle school! Sixth grade brings many new experiences and opportunities for your child at South Middle School. 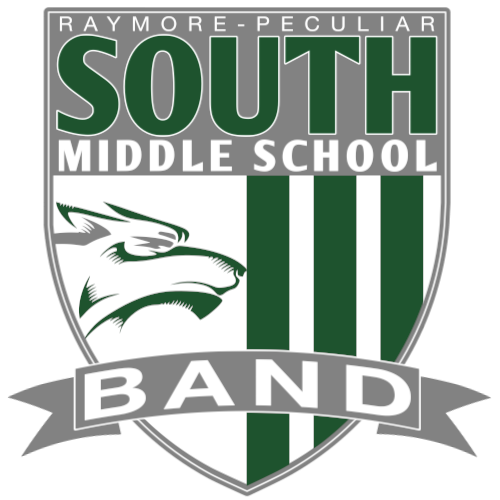 One of those opportunities is band and I want to personally invite you to join one of Raymore-Peculiar’s premiere student organizations. The Ray-Pec South Middle School band program is dedicated to helping students become life-long musicians and productive learners. Music is an essential part of a complete education, and through band, students can develop friendships and life skills that prepare them to become strong leaders. Music education opens doors that help children pass from school into the world around them...a world of work, culture, intellectual activity, and human involvement. The future of our nation depends on providing our children with a complete education that includes music. Getting started with band can seem difficult, but we will help you every step of the way. We have helped hundreds of families go through the process and we will help your family go through our carefully planned steps, too. All 5th grade students are invited to participate in our "Try the Instruments" event. This event will be held March 14, 2019 and is an opportunity for all students to find out which instrument is a good fit for them. We've learned over the years that students need help to select an instrument. The truth is, the instrument chooses the student. Every person has different qualities from facial features to physical size that can make some instruments a better match than others. Our goal, is to help your child find the instrument that they are most naturally able to play. Finding the right fit makes learning to play an instrument much more fun. We bring in professional, experienced musicians to help students try out the instruments. This way, when your child is trying an instrument, they are getting help and advice from an expert. We have refined this process over many years and have found it to be our greatest strength in the instrument selection process. Most students quickly realize that they are naturals at some instruments, but not others, and students want to learn the instrument they feel the most comfortable playing. After students try the instruments, they will rank their top 3 choices and turn in your paper to receive a recommendation. Instrument needs and limitation plays a factor in the recommendation because high quality bands require a variety of instruments. We can't allow 50% of students play the tuba no matter how awesome it is. Some instruments have a more limited number of positions available, such as tuba and baritone. ​You will need to mark band (with the correct starting instrument) on your school enrollment form that you receive from the Middle School. The forms will be given to students in the weeks leading up to spring break. Important: Band is an advanced music course...effort, perseverance, and reading skills are required. Band is a full year course. Buying an instrument is an investment. We want to help you get the right quality instrument for your beginner so they can be successful in band. Not all instruments are created equally and some of the low cost option found online don't hold up. Ray-Pec partners with Meyer Music to offer a great selection of high quality instruments within several price ranges. Once your child is enrolled in band, we will help you get an instrument. The Instrument Night event will be held on April 16, 2019, 5:30-6:30pm at South Middle School. You can secure your instrument with a down payment on this night (either purchase or rent-to-own) and begin making payments once your child begins playing (either summer school or the beginning of the school year). You can arrive anytime between 5:30 and 6:30. Please plan to wait in a short line to meet with an instrument representative. Most families are in and out within 30 minutes. A repair agreement is available to fix problems if they come up. As your child grows and improves, an upgrade program is available where your can apply rental credit from your current instrument toward an upgraded instrument more appropriate for advanced students. We typically recommend this during the second year of band. If your child chooses not to continue band after the first year, you can return the instrument and stop making payments. If you have additional questions about the rental program (or purchasing an instrument), please attend the rental night to speak directly with a Meyer Music representative. Watch this video to get an idea of what band has to offer your child. Note: Ray-Pec Band begins in 6th Grade. Band is so much fun! Learning an instrument is fun! Try the Instruments on March 14, 2019, 6-8:30pm at South Middle School! No problem! We would love to help you learn more about our band program. Use the form below to ask questions. My contact information is also available.